Damer Builders have been established in the Melbourne building, home renovation and restoration industry for many years. As a member of the MBA our quality and workmanship speaks for itself. Damer Builders is a family owned and operated company, implementing many traditional values and beliefs. Throughout the years we have gained much experience in our industry, constantly gaining praise for the professionalism and hard work we put into each and every project. Communication is the key to a successful company, it is for this reason that we take the time to talk to each customer, and gain an understanding of what they are trying to achieve. By communicating throughout the project we ensure that all our clients receive the desired finished product. We always exceed our customers expectations. We build and renovate beautiful homes. Did you know a full renovation can cost a similar amount to building a new home? Speak to our building consultants on what is the best plan for you. A sloping site often presents many challenges when building. Foundations need to be planned correctly; the plans must incorporate smart use of the slope and forward planning of the build to avoid exorbitant costs. At Damer Builders we are very familiar in building on slopes. Our team are experts in sloping site building plans and using proper building materials to maximise a sloping site. We will deliver a home that takes advantage of the slope and keeps costs low when dealing with a sloping site. Our team is ready to get started on your building project. Whether it is a custom new build or home extension we build to the highest quality. 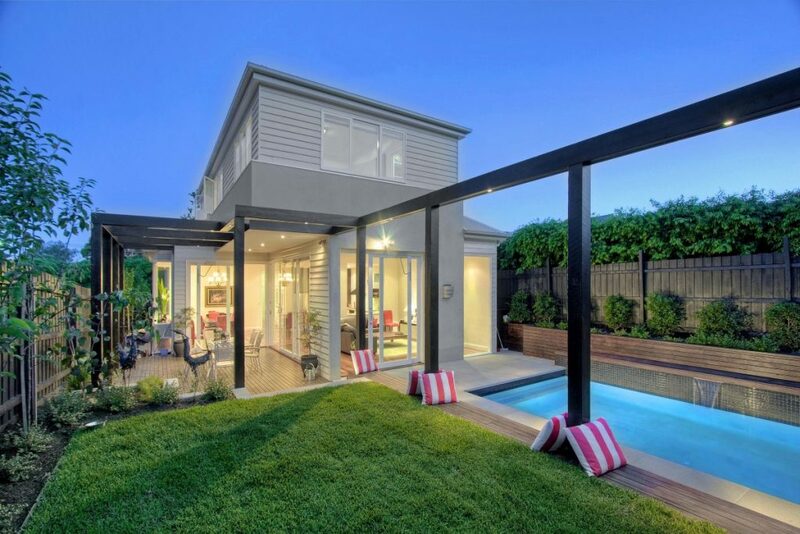 Our experience in the Melbourne building industry is extensive. We have built customs home across the inner city to the outer suburbs. If you are worried that your home may present a challenge for an extension such as a site slope or close neighbours, then speak to us for solutions. We have built many extensions with site challenges and have always produced outstanding renovations. Contact us now to get free advice. A new 1st floor extension added with a sitting room, bathroom and 2 bedrooms with WIR and fittings. A large open area renovated with 3000mm high glass sliding doors to 3 walls which leads out to the deck area with landscaped garden & built in pool. We strive to provide luxury and affordable renovations across all projects. Whether it is a knock down and rebuild or bathroom renovation, every project is important. Damer undertakes many varied Melbourne building projects; including custom new builds, home extensions and kitchen renovations. All built to the same high quality finish. We have dedicated a building team. All builds are completed in consultation with you and we work with your with your unique requirements. Our mission is your vision. We create custom and unique builds to the highest standard. Damer is recognised in the Melbourne building industry as professional and quality builders.